Blowout Sale! Save 51% on the D.Bella Helix Earrings, 18G 8mm 10mm 12mm PA(Prince Albert) Rings Cartilage Septum Earring Hoop Piercing Jewelry by D.Bella at Mas Fashion. MPN: DB18-034-2MC. Hurry! Limited time offer. Offer valid only while supplies last. 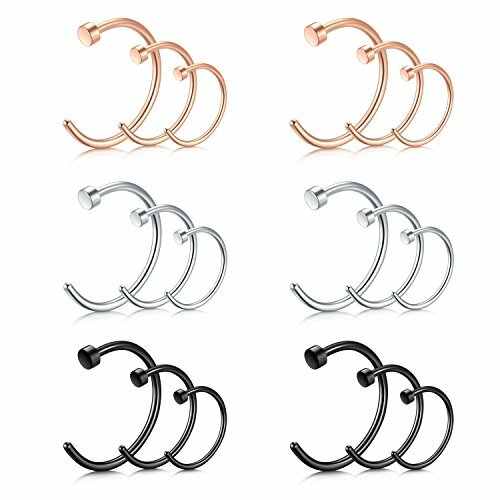 ➤[Hypoallergenic] the clip on nose hoop rings are made of 316L stainless steel.Nickel-free and lead-free. Could be long time wearing.